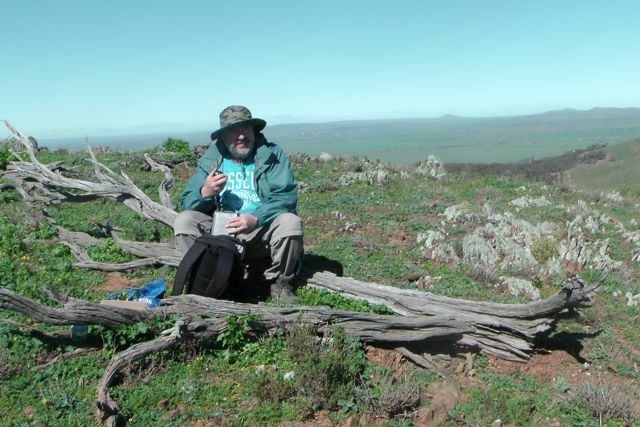 My first planned activation for Saturday, 10th August, 2013, was Oladdie Hills, VK5/ NE-068. 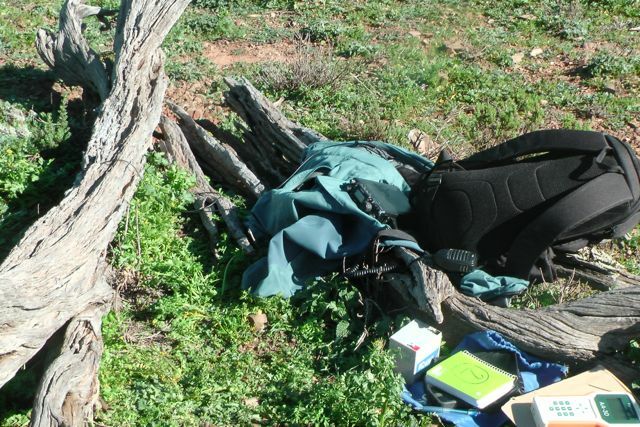 The summit is located on private property and is situated about 22 kms north of Orroroo. It is about 5 kms east of the little town of Eurelia. I got up at 6.00 a.m. to a nice warm hotel room, but outside the temperature was below zero, and there was a severe frost. After a warm shower and breakfast and preparing my gear, I headed outside to the cold, and waited for Ian, VK5CZ who was driving up from his home in Clare. Despite it being bitterly cold, there was a spectacular sunrise. 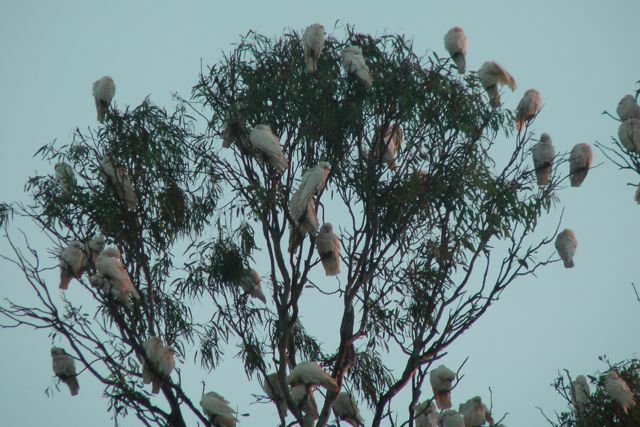 And just across from the pub there was a noisy mob of corellas in a gum tree, obviously trying to wake up everyone in Orroroo. Orroroo is a small town in the southern Flinders Ranges, about 270 kms north of Adelaide. It has a population of about 543. 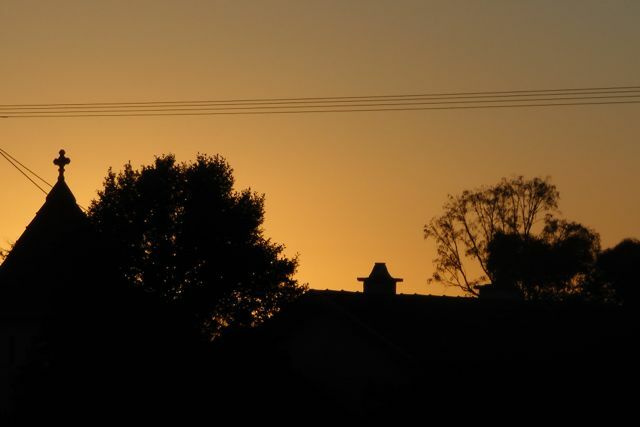 “Orroroo” is generally accepted as being derived from the Aboriginal “oorama” – “rendezvous of the magpie”, although others believe it to mean “early start“. My accomodation for 2 nights was the Orroroo Hotel (highly recommended – good food, cheap accomodation, cold beer, and friendly licencees). After Ian arrived at the pub to pick me up, we headed first to Tank Hill lookout at Orroroo, before making our way to the summit. Water is gravitated from the concrete tank at the “lookout” to the town. From the tank there is normally an excellent view over the artesian basin in the valley of the Walloway plain, the reservoir and the township of Orroroo. 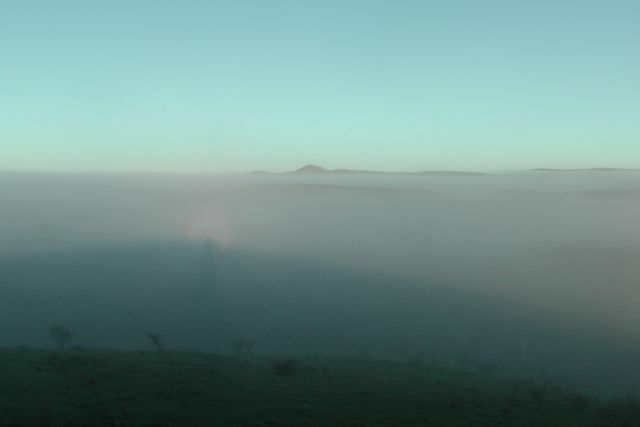 However the whole area this morning was fogged in and it was bitterly cold. Ian and I then travelled north, out of Orroroo, along RM Williams Way. The road was named after Reginald Murray Williams, widely known as just ‘R.M.’, who was an Australian bushman and entrepreneur who rose from a swagman to a millionaire. He became known for creating an Australian style of bushwear recognised world wide. 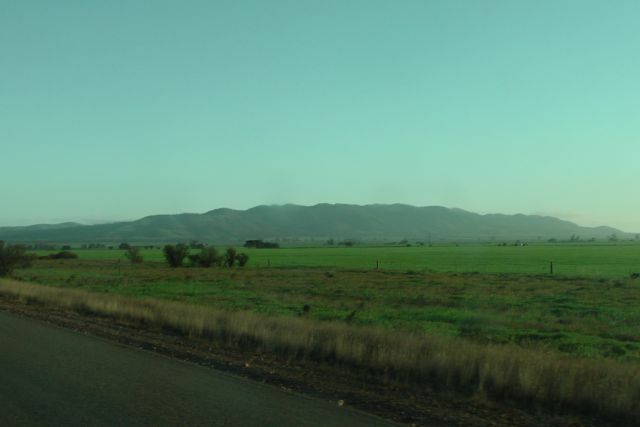 The Oladdie Range stretches for quite some distance, north – south. We accessed the summit via private property off Hooper Road. It was quite a significant drive across paddocks (about 4 kms) until we could go no further in the 4WD, and then a 4 km walk to the summit. The drive is strictly 4wd, as the terrain is very rocky in parts and you are required to cross several significant creek beds. The walk to the summit was quite pleasant. The fog had partially lifted although there was still quite a bit of very low lying club. But the good thing was that the sun was out. There was not a cloud in the sky. 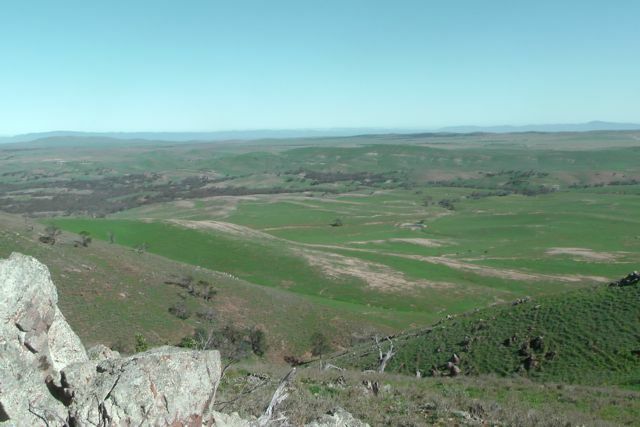 The countryside here in the southern Flinders Ranges was very green and lush, due to recent very heavy rainfall. As a consequence the sheep were looking in very good condition. Remember this is private property, so please shut all gates. Ian and I walked through some fairly thick scrub enroute to the summit. The ground is also very rocky. 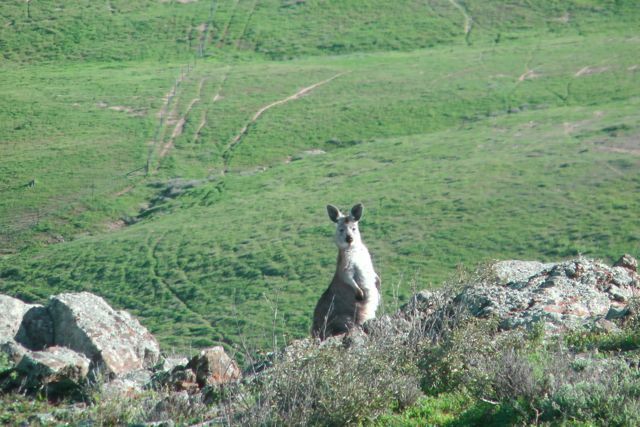 Ian and I saw dozens of kangaroos and euros on our way to the summit. I was recently asked in an e-mail by Ed, VK2JI, as to what a euro was ? The Euro is also referred to as the Common Wallaroo “Macropus robustus”. 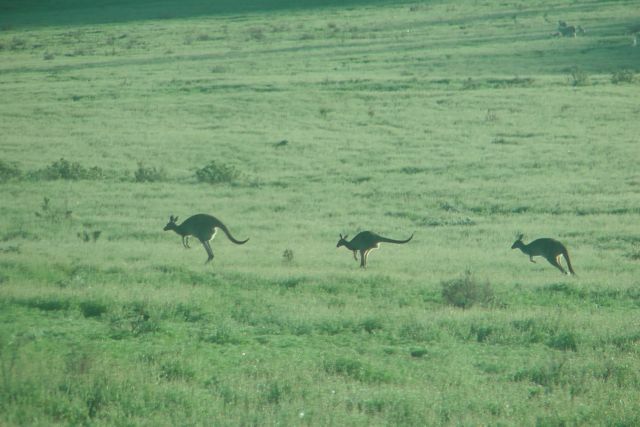 They are smaller in size to Red or Grey kangaroos. They are also of ‘high’ country, and have a distinct preference for ‘high’ places, and are typically found on rock ledges, escarpments, stony ridges and in fact anywhere where they can get a good view of their surroundings. As is almost always the case with this SOTA activity, the hard walk was rewarded with spectacular views in all directions. Orroroo is visible down to the south, and the little towns of Walloway, Eurelia and Carrieton to the west. 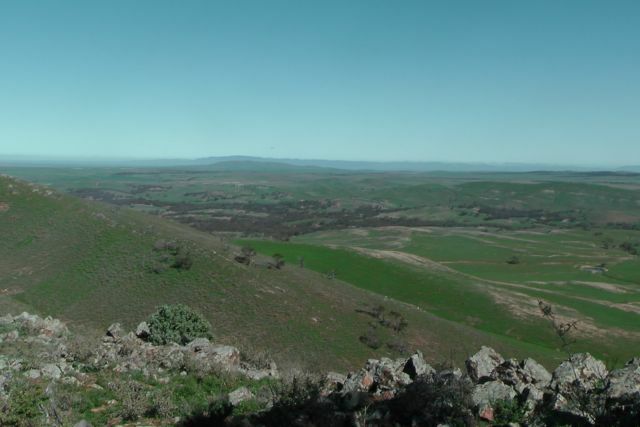 Down to the south west, the imposing Mount Remarkable was able to be clearly seen. Out to the east you could clearly see Black Rock Summit and Depot Hill. There are no trees on the top of the summit, but I did find a nice fallen log which looked just right as a ‘shack’. 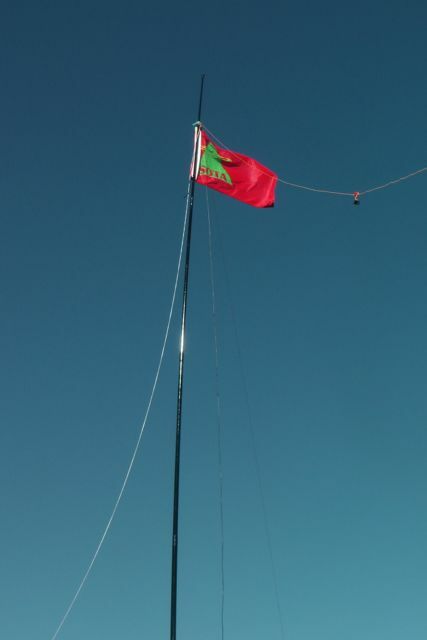 I used the log to secure the 7 m squid pole, and stretched out the 40m/20m linked dipole. My transceiver was a Yaesu FT-817nd on the 5 watt output setting. Ian found a nearby dead tree which he used to secure his squid pole, and his chair for the morning was a pile of moss rocks. Ian also used his home brew linked dipole and his Elecraft KX3 transceiver. My first QSO of the morning was with David VK5KC who was operating from “The Shack” belong to the Adelaide Hills Amateur Radio Society (AHARS). I then worked David as VK5BAR, the AHARS club call. My 3rd QSO was with old time mate Scott, VK7NWT with a good strong signal. And my 4th qualifying contact was with regular ‘Chaser’ Nev, VK5WG with his normal 5/9 +++ signal. This was followed by the regular pile up of SOTA chasers. This was a fun activation. I spoke with Andrew VK2ONZ, who was operating QRP. Andrew is a regular and keen QRP operator. He was my 8th contact on top of the hill, so following working Andrew I called for more QRP stations, and what was to follow, was a constant stream of QRP ‘Chasers’ which was really pleasing to hear. And they all had terrific signals on top of Olladie Hills. One other interesting contact was with John, VK5AJQ, who was using the call sign of VK5BP. He was operating from ‘Woodhouse’ scout camp in the Adelaide Hills. I worked a total of 30 stations in 30 minutes on 40m SSB in VK1, VK2, VK3, & VK5. The following stations were worked:- David VK5KC; David VK5BAR; Scott VK7NWT; Nev VK5WG; Andy VK5LA; Tony VK3CAT/m; Ed VK2JI; Andrew VK2ONZ/qrp; Col VK5HCF/qrp; Terry VK5ATN/qrp; Glen VK3YY/qrp; Peter VK3PF/qrp; Fred VK3JM/qrp; VK3OHM/qrp; Ernie VK3DET/qrp; Phil VK3BHR/qrp; Wayne VK3WAM/p (SOTA); Brian VK5FMID/qrp; John VK5BP; John VK5AJQ; Larry VK5LY; Andrew VK2UH; Steve VK3MEG; Ian VK3TCX; Rik VK3KAN; Matt VK1MA; Mark VK1MDC; VK3DEE/m; & Rob VK2FROB. A good fun activation, but not without its associated issues. The signal reports on my last 5 contacts dropped dramatically. Upon checking the antenna, I found that the connection point from the coax to the BNC plug was faulty. The coax is RG174, so it is very lightweight and thin. I think the stress placed on the preterminated point at various windy SOTA activations, has finally taken its toll. Something to look at before my next set of activations.